Samsung Electronics East Africa Office now has two extra feathers in it’s cap. Two of the leaders got promoted and starting this month they wear the big titles in the region. Previously heading several countries in the Eastern Africa region, both Robert Ngeru, Chief Commercial Officer Samsung Electronics East Africa and Manoj Changarampatt, HHP Business Lead SEEA will now expand their territories in the region that is Eastern and Central Africa. 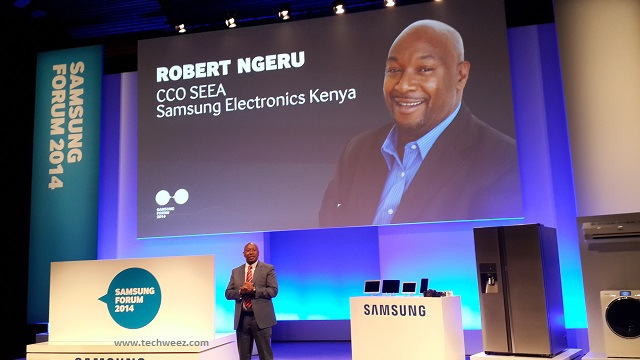 Robert Ngeru is now the Vice President for Samsung Electronics East and Central Africa, while Manoj Changarampatt is the new IT and Mobile Director for Samsung Electronics East and Central Africa. These two will continue to operate from the West End Towers office in Nairobi, only their travel increases as they cover more ground. Over the last two years, Samsung has experienced huge growth not only in the world but very noticeably in the region and has become one of the biggest brands in the region. Recent GFK results show huge growth in mobile with Samsung leading in smartphones revenues in Kenya where the two are headquartered, of course other markets in the region have also experienced growth. Among the other things the two are passionate about, these two have a passion each, Robert is passionate in getting solutions to work for consumers while Manoj is passionate in creating ecosystems that last. Manoj is quite a cog in the various Samsung partnerships in the region with different institutions like Universities, Tech Incubation hubs and Innovation Centers. He believes people are wealth and the more you have gaining value from you the easier your work selling gets. Robert on the other hand says he loves making things easier for people. “I like developing solutions that make it easier for people to do things, and that is reflected in the Research and Development Samsung does in the region,” said Robert at a recent conversation we had. Robert added that it makes sure the company develops products that matter to the people and are relevant to what they do day to day, with their environment and infrastructure available to them as a very important factor.